Another not quite Acute themed post, but important enough to me to disregard all self-imposed rules in an attempt for maximum exposure. For 6 years now, I’ve thrown a disco halloween party that also serves the purpose of being a birthday party for my girlfriend, roommate and crafts partner Nicole. Starting as part of the long-forgotten Alldisco party, these parties have moved around Williamsburg and have had many different fun and silly themes. Dancing In Space, Wild Kingdom, The Haunted Disco, Night of the Living Disco Dead and last years 80’s Prom of Horrors. This year we also wanted to celebrate the first year anniversary of Nicole’s online literary and arts journal, Underwater New York. So that brings us to this years theme…THE UNDERWATER DISCO. 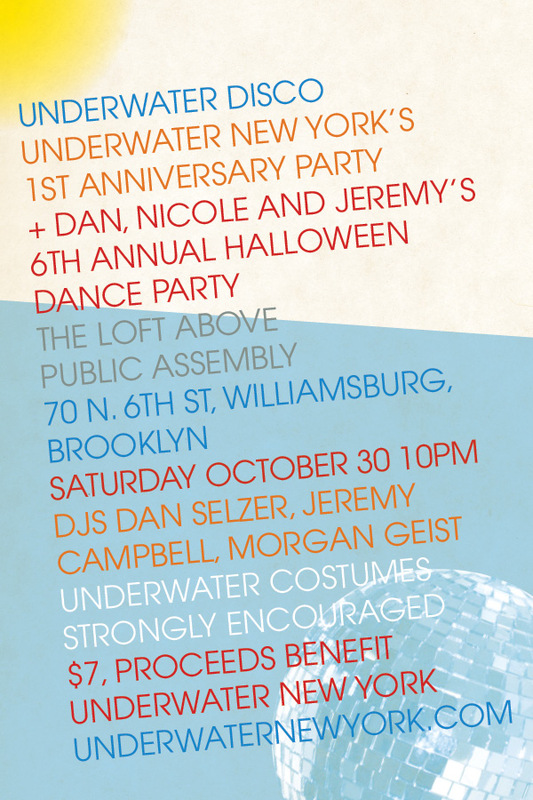 You can dress up however you like, but water themed costumes are encouraged! For instance, I am going as a Music Pirate. Like the notorious 18th century pirates of the west indies but instead of stealing barrels of wine and gold coins I steal music and share it illegally on the internet. Arrrr that’s a low bit rate, matey! As usual, I will be joined by my erstwhile DJ partner Tropical Jeremy, who’s already halfway there with a name like that. And as a very special guest, we have none other than Morgan Geist of the pioneering and influential Metro Area and his label Environ. He knows a thing or two about water…just ask him about the fountains of Wayne. It’s a rare opportunity to hear a world-class DJ playing such a fun local down-to-earth party, so don’t miss it! Here are the details in case you’re too lazy to look at that flyer up there….